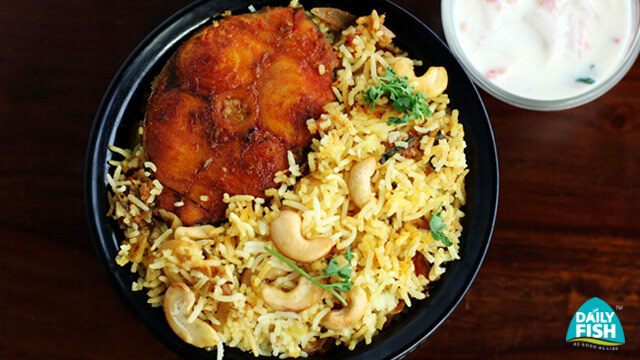 Fish Biriyani is a dish that showcases the rich and diverse culture of Kerala which is influenced from both Arab and traditional cuisine. 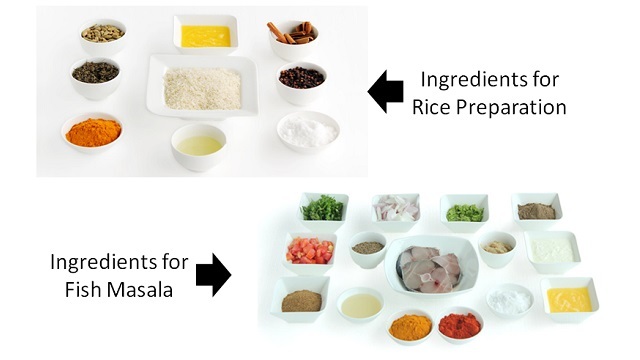 Ingredients For Fish Masala . Ingredients For Marinating Fish . Defrost the fish as per instruction. Wash and marinate the fish with the given ingredients and keep it in refrigerator for 1 hour. Fry Fish in Ghee and keep it aside. In the same pan add onion and sauté till golden brown and add ginger garlic paste. Sauté for 2 min and add tomatoes, garam masala, coriander leaves, salt and cook for few minutes. Add yogurt and put the fried fish in the mixture. Keep for a minute and remove from fire. In a pressure cooker add all the ingredients except lime juice and add 4 cups of water. Wait for one whistle, remove from fire. In a large dish heat ghee and add a layer of rice with 2 tbsp lime juice. Now layer it with fish masala on top of it. Now again layer it with the remaining rice on top of it. Add the remaining ghee to it and keep the lid closed for 10 min. Before serving add fried onions, cashew nuts and raisins (optional). Serve with sweet pickles, curd salad, pappad and boiled egg.